Beautiful Surprise - code E07 (Exotic) - Beautiful Flower Bouquet with Oriental lilies - 6 along with fillers wrapped in a decorative paper with Bow. Note: Deliveries with in Hyderabad and Secunderabad only. LEAD TIME FOR SHIPPING: 1 WORKING DAY. True Inspirtaion - code E01 (Exotic) - Beautiful Flower Arrangements contains Pink roses 35 along with Fillers. 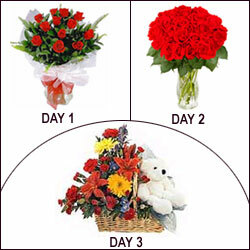 Always Yours - code E02 (Exotic) - Beautiful Flower Arrangements contains Red and Yellow Carnations 20 along with Fillers. Choco Bunch - code E50 (Brand - Exotic) Beautiful Rose Choco bouquet with 16 pieces Ferrorochers , 10 Red Roses along with fillers wrapped in a decorative paper with bow Note: Deliveries with in Hyderabad and Secunderabad only. LEAD TIME FOR SHIPPING: 1 WORKING DAY. Pure Elegance - code E61 (Brand - Exotic) Beautiful flower arrangement with 15 pink carnations, 10 orchids along with fillers Note: Deliveries with in Hyderabad and Secunderabad only. LEAD TIME FOR SHIPPING: 1 WORKING DAY. Fall in Love - code E64 (Brand - Exotic) Beautiful flower arrangement with 5 Bird of Paradise, 15 Red carnations, 3 white Lilies along with fillers. Just Smiles 4 U - code E09 (Exotic) - Beautiful Flower Bouquet with Roses - 20 along with fillers wrapped in a decorative paper with Bow. Make Her Day - code E37 (Brand - Exotic) Beautiful flower basket with 10 orchids, 6 white glads along with fillers Note: Deliveries with in Hyderabad and Secunderabad only. LEAD TIME FOR SHIPPING: 1 WORKING DAY. Cool Bunch - code E05 (Exotic) - Beautiful Flower Bunch with 12 White Roses wrapped in a decorative paper with Bow. Charming Basket - code E04 (Exotic) - Beautiful Flower Arrangements contains Gerberas 10, Daisy 10 with Fillers and Cane Basket. Sweet Surprises - code E18 (Exotic) - Beautiful Flower Bouquet with 12 Pink Roses along with fillers wrapped in a Jute decorative paper with Bow. Just 4 U - code E08 (Exotic) - Beautiful Flower Bouquet with Roses - 12, Lilies- 4 along with fillers wrapped in a decorative paper with Bow. Amazing Wishes - code E10 (Exotic) - Beautiful Flower Bouquet with White Lilies - 10 along with fillers wrapped in a decorative paper with Bow. Perfectly URS - code E43 (Brand - Exotic) Beautiful Flower arrangement with 6 Anthuriums, 10 red carnations along with fillers Note: Deliveries with in Hyderabad and Secunderabad only. LEAD TIME FOR SHIPPING: 1 WORKING DAY. Exploded Smiles - code E30 (Brand - Exotic) Beautiful flower arrangement with 12 orchids along with fillers Note: Deliveries with in Hyderabad and Secunderabad only. LEAD TIME FOR SHIPPING: 1 WORKING DAY. Delicate Love - code E14 (Exotic) - Beautiful Flower Bouquet with Rajnigandha - 10, Lilies - 5 along with fillers wrapped in a decorative paper with Bow. Love Treasure - code E11 (Exotic) - Beautiful Flower Bouquet with Anthurium - 10, Orchids - 4 along with fillers wrapped in a decorative paper with Bow. Precious Beauty - code E54 (Brand - Exotic) Beautiful flower basket with 15 orchids along with fillers Note: Deliveries with in Hyderabad and Secunderabad only. LEAD TIME FOR SHIPPING: 1 WORKING DAY. Cheerful Celebrations - code E56 (Brand - Exotic) Beautiful flower arrangement with 15 orchids along with fillers Note: Deliveries with in Hyderabad and Secunderabad only. LEAD TIME FOR SHIPPING: 1 WORKING DAY. Basketful of Thanks - code E60 (Brand - Exotic) Beautiful flower arrangement with 8 white glads, 15 orchids along with fillers Note: Deliveries with in Hyderabad and Secunderabad only. LEAD TIME FOR SHIPPING: 1 WORKING DAY. Passionate Love - code E74 (Brand - Exotic) Beautiful flower bouquet with 30 Carnations, Purple Archids 10 pcs, Yellow Glads 4 nos with fillers. Bunch of Happiness - code E47 (Brand - Exotic) Beautiful flower arrangement with 6 yellow lilies, 20 Rajani Gandha flowers along with fillers wrapped in a decorative paper with bow Note: Deliveries with in Hyderabad and Secunderabad only. LEAD TIME FOR SHIPPING: 1 WORKING DAY. UnForgettable Moments - code E13 (Exotic) - Beautiful Flower Bouquet with Anthurium - 10, Lilies - 6 along with fillers wrapped in a decorative paper with Bow. Something Special - code E19 (Brand - Exotic) - Beautiful flower basket with 20 roses, 2 lilies along with fillers and a candle. Fresh Feelings - code E18 (Brand - Exotic) - Beautiful Flower Basket with 30 Pink Roses, 2 Lilies along with fillers.